1. Stand straight with your feet slightly wider than shoulder width apart and raise your arms to the sides. 2. Bend and rotate your torso to the right, touching your right feet with your left hand. 3. Return to the starting position and repeat on the other side. Keep your back and your arms straight and engage your abs. Maintain a neutral spine and use your abs and obliques to control the movement. Breathe deeply and inhale as you lift your torso and return to the starting position. The bent over twist is a great exercise to improve your flexibility and stability. It’s also a good warm-up exercise because it rotates your body and moves it through the transverse plane of motion. While getting your body ready for a workout it’s important to do, not only back and forth and side to side movements, but also rotation movements. 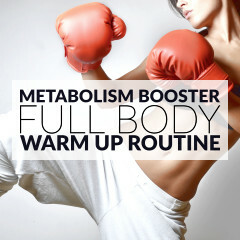 This exercise is a great addition to any thorough warm up routine. 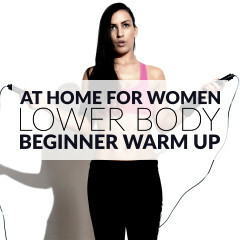 Do it at the end of the warm up period for about 30 seconds to 1 minute.